Whether you’re going back to school or not (I am not), fall always seems like such a good time for fresh starts. Maybe even better than new year’s, since it doesn’t catch us in the midst of holiday aka temptation season. It’s definitely a cultural construct in some respects, given that I spent most of my life, as you may have, in an 18 year cycle of school-year/summer-break/school-year/etc. Not exactly the optimal educational system, but it is what it is. School or no school, though, the weather in my temperate climate, with fresh, cool air and falling leaves inspires me to relax and reset. Maybe that sounds like a fantasy, if you’re busy sending kids back to school and running around to 3 different sport practices or activities every night of the week. I can relate to a busy fall, too, especially this year, with wedding planning in full swing. I’m staying in the kitchen enough to keep it as my release, yet not so much as to take over my life. Lately, a lot of simple, healthy dishes have materialized as a result. First there was an easy, six ingredient curry, and now this spicy Italian one bowl dinner. I couldn’t fit the name of every ingredient into the recipe title, but aside from spicy roasted broccoli and fluffy, red, rustic quinoa, there’s some saucy, salty pesto chickpeas and sweet, nearly caramelized baby tomatoes. “Italian” seemed like an apt description to me, given the pesto, tomatoes, and optional parmesan topping. I think it will satisfy your craving for saucy, filling Italian pasta or pizza, without gluten, meat, or piles of cheese. When I’m not making chili and cornbread, this is exactly the type of meal I want for dinner on a chilly autumn evening. It’s weird publishing a recipe for one bowl dinners, because they’re so flexible they really don’t need a recipe. BUT, when I find one that’s quick and has some special components, like roasted, pesto coated chickpeas and juicy baby tomatoes, I just have to share. I’m in Minnesota right now, staying with my parents, working on wedding planning and hitting up as many of my favorite food spots as possible. As always, diet is a hot topic in our family. We’re all experimental, having experienced positive changes and seeking even more of them. I get the idea my parents could go meatless, but, like many, they’re worried about getting enough protein for their active lifestyle. Not a totally invalid concern, especially given the messages we get via mainstream food marketing. I’m a firm believer that going meatless is not only feasible, but beneficial, and this quinoa bowl is just one answer to the perceived protein dilemma. I’m not a nutritionist or dietician, but I do know that protein deficiency is an almost unheard of condition in developed nations, thanks in part to protein packed vegetarian superfoods like quinoa and chickpeas. On Thursday, to do some planning for our rehearsal dinner, Steve and I stopped by Spoon and Stable. Amidst beautiful cocktails, reinvented classics like fried cheese curds, and a heavenly Thai-inspired eggplant and coconut milk stew, my sorghum risotto entrée was a standout. At the time, all I knew is that it was creamy, flecked with chanterelles and seasonal veggies, and topped with a deep-fried squash blossom stuffed with some kind of cheesy sauce. 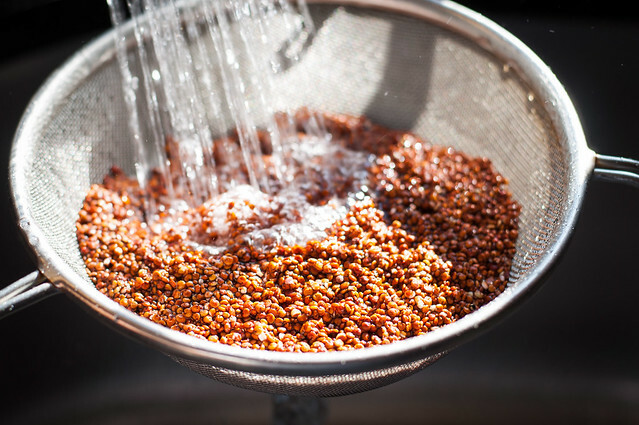 When my mom heated up the leftovers, though, she delved into the internet’s resources on sorghum, discovering yet another source of vegetarian protein, not to mention fiber and iron. If you don’t have quinoa on hand for this bowl, feel entirely free to substitute brown rice, sorghum, or whatever your favorite healthy grain may be. Tomorrow is a big day. My dad turns 55, and to celebrate, we are heading to the Minnesota State Fair to test our willpower. “The Fair” is not your average county or state fair. It’s supposedly the largest of any state fair by daily attendance, which is oh-so-evident by the endless sea of heads you overlook while roaming the sprawling grounds. I like to think Minnesota’s fair is a pioneer in testing the limits of deep fried food on a stick, my favorite being the deep fried Snickers (none of the famous pork chop on a stick for me). I’ll also be locating the giant corn roast booth and a little box of fried cheese curds, a much less sophisticated version than those we tried at Spoon and Stable. I’ve always had a love-hate relationship with The Fair, but I think it makes sense to view it as family time, take in some of the best people watching available, indulge in a few bites of sinful treats, and most definitely take a ride down the corn slide, in hopes of burning off just a few of those calories. 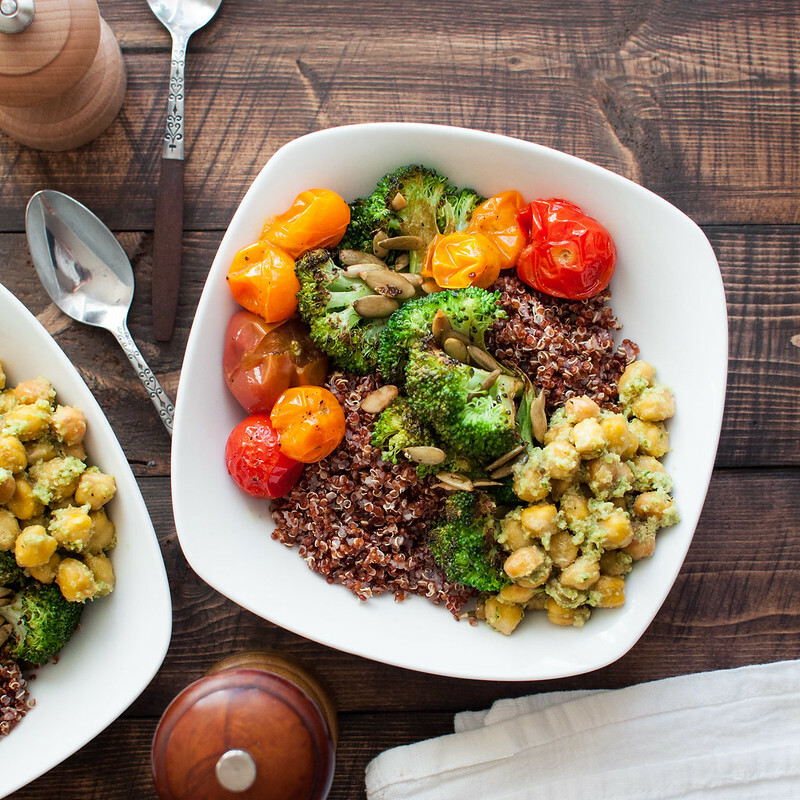 When it’s all said and done, I’ll use Monday night to prepare a much more fresh and healthy dinner, possibly some variation of these broccoli quinoa bowls, for my family, helping us all set out for fall on the right foot. 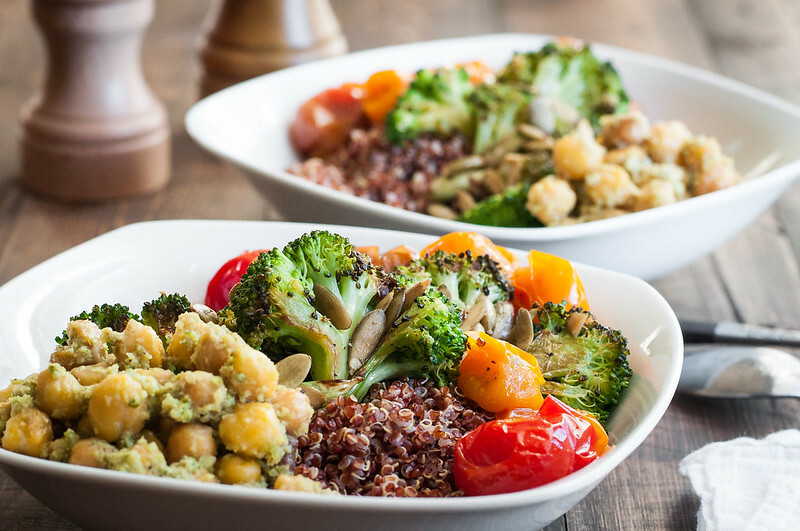 When you're craving Italian flavors without a huge dose of heavy cheese and starchy pasta, try throwing together these healthy, meatless quinoa bowls. All the components roast for about the same time while the quinoa cooks, so it's ready much quicker than you'd guess! Preheat oven to 400 (F) and position 1 rack near the top and another near the bottom. Bring broth to a boil in a medium saucepan, then stir in quinoa. Return to boil, cover, and reduce heat to low. Simmer 12 to 15 minutes, until tender, then drain, return to pan, and cover with a dish cloth and the lid for 5 minutes or more (the cloth absorbs steam so quinoa doesn't become mushy). 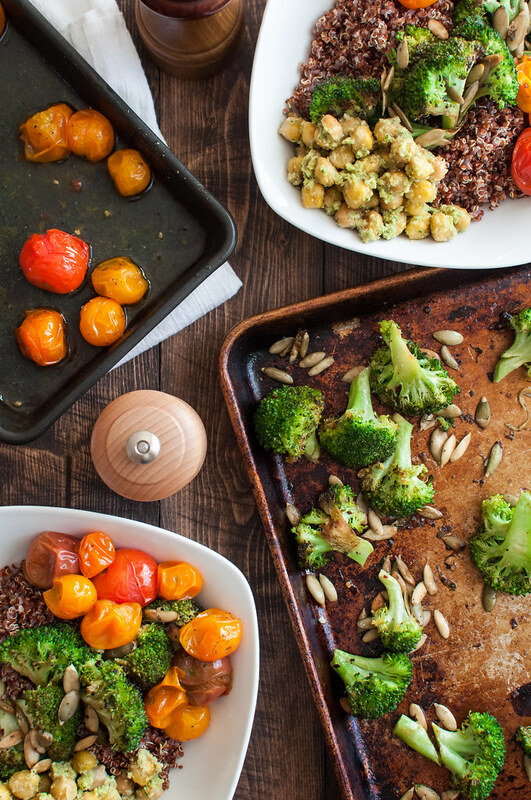 Place broccoli on a large rimmed baking sheet and toss with 1½ tablespoons oil, sprinkle with salt and pepper, and arrange on one side of the baking sheet. Place chickpeas on the other side of the sheet, drizzle with about 1 tablespoon oil, and stir (don't season). 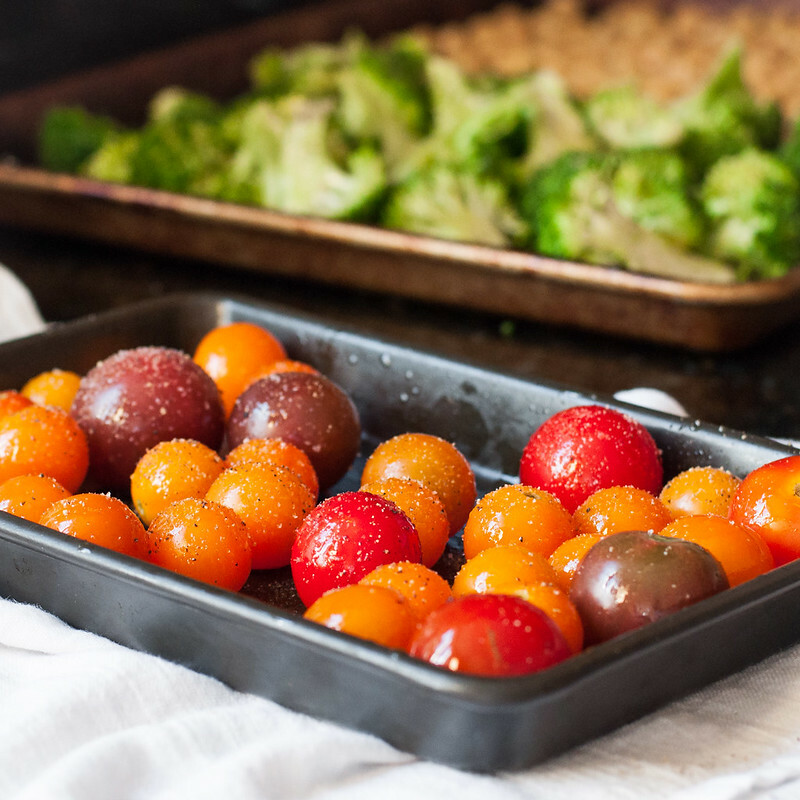 On a small rimmed baking sheet, toss tomatoes with ½ tablespoon oil and sprinkle with salt and pepper. Bake both pans for 10 minutes, with broccoli pan on the lower rack, then stir each ingredient. Sprinkle broccoli with red pepper flakes and pumpkin seeds. Roast both pans 5 to 10 more minutes, until tomatoes are wrinkled and juicy, broccoli is browned in places and tender inside, and chickpeas are starting to brown. In a medium mixing bowl, mix pesto with 1 T lemon juice and 1 T water and set aside. Immediately toss roasted broccoli with 2 tablespoons lemon juice on the tray. Add chickpeas to the pesto and stir to coat. 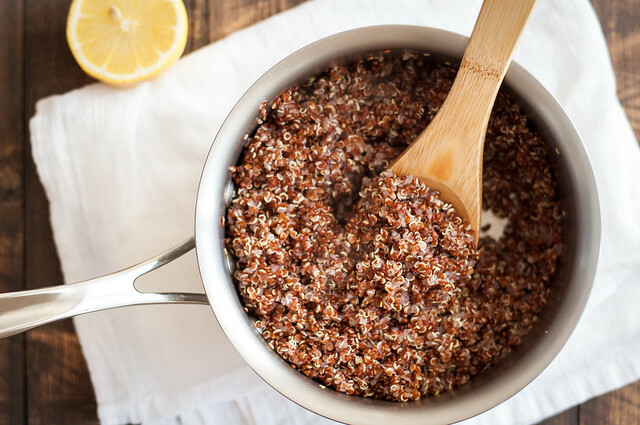 Toss quinoa with a bit of good olive oil, salt, and pepper. 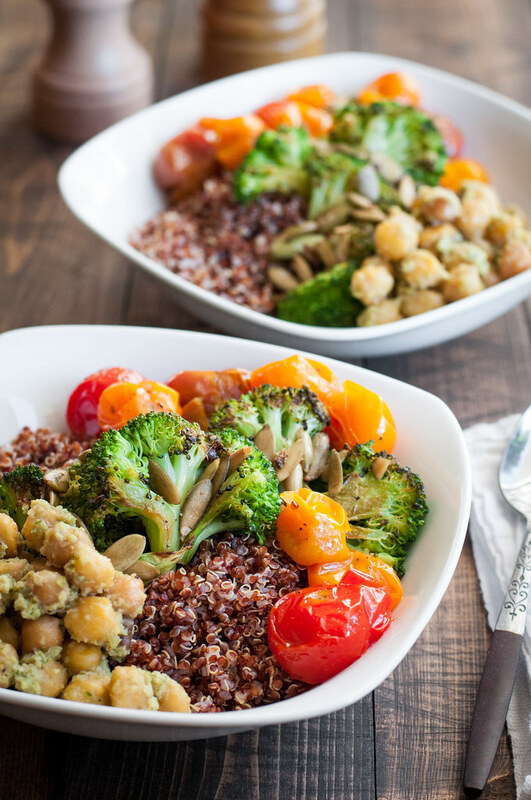 Build each bowl with a generous scoop of quinoa, topped with half the broccoli, pesto chickpeas, and roasted tomatoes. Sprinkle with parmesan cheese and fresh herbs, and serve with lemon wedges. The quantities shown will yield good sized bowls for two. However, feel free to adjust based on what you have--that's the beauty of veggie bowls! 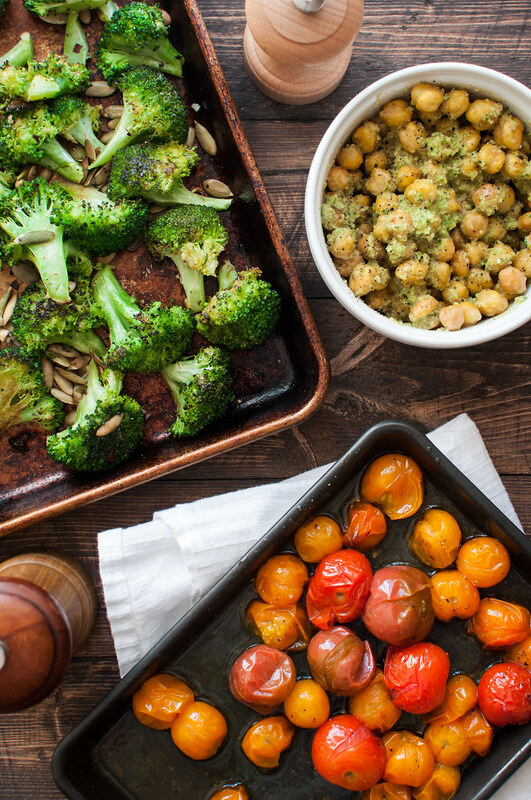 Leftovers keep well, so if you have lots of broccoli and tomatoes to use up, roast them all! Gluten free and vegetarian. Vegan if you use/make vegan pesto and don't add any other cheese. Note: This page contains affiliate links. It does NOT contain sponsored content. Affiliate links (to products I recommend, on Amazon) offset my ingredient and website maintenance costs, so I can keep bringing you meatless recipes like this one. Thanks!